Though the American Coot swims and dives like a duck, it is a rail. It can be distinguished from all ducks by its conical, white bill and white shield on the forehead. it is widely distributed across North America from British Columbia eastward to the Atlantic Coast and southward to Central America and the Caribbean. In winter, it is found in open water from the northern United States southward. 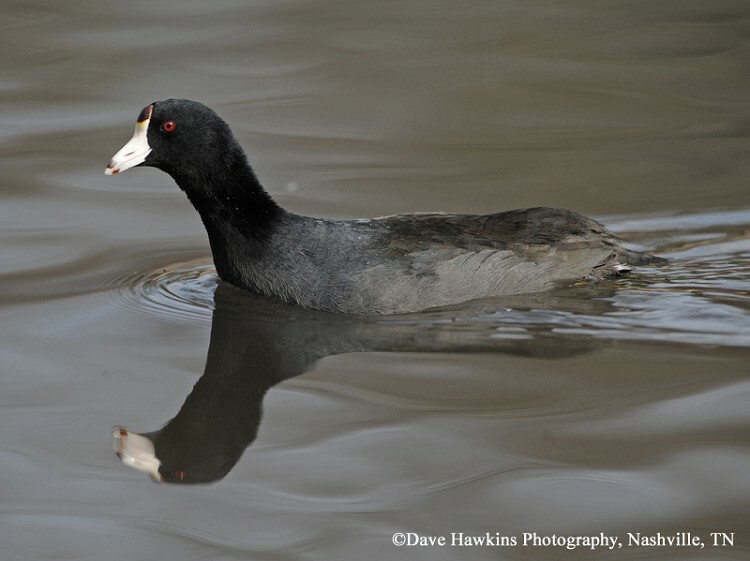 The American Coot is commonly found in Tennessee during migration and during the winter, with the greatest numbers in the state from October through April. Description: This nearly all-black chicken-like bird has a white triangular shaped bill with a shield that extends up the forehead, and white stripes on the sides of its undertail. Common Moorhen has a red bill and frontal shield, a horizontal white line on the body, and is mostly white under the tail. Habitat: Open bodies of water including lakes, ponds, and reservoirs. Diet: Mainly eats aquatic plants and algae, also some terrestrial vegetation, aquatic invertebrates, and vertebrates. Nesting and reproduction: American Coots will build several "dummy" nests that are used during courtship and for brooding young. Clutch Size: 9 to 10 eggs. Incubation: Both parents incubate the eggs for 21 to 25 days. Fledging: The young leave the nest shortly after hatching and are fed by the adults for a few days until they can feed themselves. They will remain in their parent's territory for at least 7 weeks. Nest: Both adults build the nest, which is a partly floating platform anchored to grass in water from 2 to 6 feet deep. They also build a similar nest to brood the young after hatching. Status in Tennessee: The American Coot is a common migrant and winter resident across the state, and a rare summer resident. Though present year round, most individuals are found in the state from early September through early May. There are nest records from East, Middle, and West Tennessee. It is considered a game species in the state, but is likely seldom taken by hunters. The oldest American Coot recorded in the wild was 22 years and 4 months old. The American Coot has webbed toes rather than webbed feet like a duck, yet it is an excellent swimmer and diver. Coots frequently bob their heads when swimming or walking. It is thought that this may give them better 3 dimensional vision. Best places to see in Tennessee: American Coots are most abundant between October and April on most large lakes, and reservoirs across the state where there is aquatic vegetation. Brisbin, I. L., Jr., H. D. Pratt, and T. B. Mobray. 2002. American Coot (Fulica americana) and Hawaiian Coot (Fulica alai). The Birds of North America, No. 697 (A. Poole and F. Gill, eds.). The Birds of North America, Inc., Philadelphia, PA.
Nicholson, C. P. 1997. Atlas of Breeding Birds of Tennessee. Univ. of Tennessee Press, Knoxville, TN.